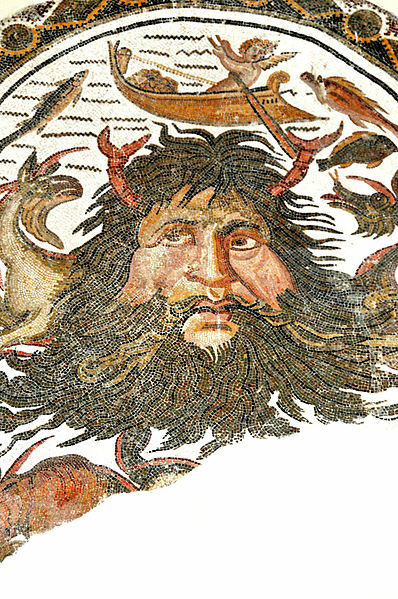 Today, most people think of Poseidon as the sea-god of Greek mythology, but Poseidon was actually just one of many sea-gods, and a relatively late comer to the pantheon of Greek deities. There were a number of gods associated with the sea before Poseidon, including the primordial god Pontus. Indeed, Pontus was considered to be one of the original gods of the Greek pantheon, one of the Protogenoi, or first born deities. Hesiod, in the Theogony, named Pontus as the son of Gaia (Earth) born without father, although Hyginus (Fabulae) named Aether (Day) as the father of Pontus. Primarily, the Ancient Greeks considered Pontus to be the personification of the Mediterranean Sea, and the god’s named can be translated as “the road”, an indication of the importance of the Mediterranean as a highway for goods, as well as a provider of food. The role though would pass onto Poseidon with the rise of the Olympian gods, and as a result Pontus was sidelined. Despite being sidelined, Pontus is still important in Greek mythology because of his family line. With Gaia, Pontus would become father, and subsequently grandfather, to most characters form Greek mythology associated with the sea. Nereus - The first born son of Pontus and Gaia was Nereus, the god referred to as the Old Man of the Sea. Nereus was associated with the Aegean Sea within the Mediterranean, and was of course father to the Nereids, the water nymphs. Thaumas – The second son of Pontus and Gaia was Thaumas, a sea god linked with the wonders and dangers of the sea, and with Electra, Thaumas would become father to the likes of the Harpies and Iris. Phorcys and Ceto – Brother and sister offspring of Pontus would become husband and wife, and as Ceto’s name means “monster” it is not surprising that the pair would become parents to many of the monsters of the deep, including the likes of the Gorgons, the Graeae and the Sirens. Eurybia – the “strong goddess” was always regarded as a minor sea deity, but was famous in Greek mythology for being the wife of Crius, and subsequently giving birth to Astraeus, Pallas and Perses. The Fish ­ - Pontus was also considered by some writers in antiquity as the father of the fish and other sea life when the sea god partnered with Thalassa, daughter of Aether and Hemera. Aegaeus – Some writers also named a god called Aegaeus as the son of Pontus and Gaia. Aegaeus was the Greek god of sea storms, and it was after this deity that the Aegean Sea was named.